Daily Illuminator: Take Candy From Kids Without The Guilt! October 3, 2017: Take Candy From Kids Without The Guilt! Of course, stealing candy from kids in real life would go too far. But Ghosts Love Candy satisfies all would-be bad guys in two ways – you get to be a baddie without actually making little ones cry and you get to hoard candy! You can't eat it, since the candies are cards, but still . . .
With Halloween right around the corner, this is the perfect time to nab Ghosts Love Candy! In the game, it's the spookiest night of the year and you are a hungry ghost who loves candy and "lives" to haunt the costumed kids who have it. You need to be careful not to scare them too much, though, or they run away, taking your candy with them! At the end of the game, the ghost with the most of its favorite treats wins. The game play is simple to learn (as someone who almost won the first time she played can attest), and the so-adorable-it's-scary art makes this game a joy. 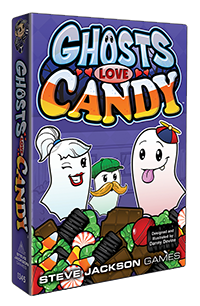 If you love candy and being the bad guy, too, head to your local game store or Warehouse 23 to add Ghosts Love Candy to your collection!